A PEN PICTURE OF KING LEOPOLD. Aristocratic in appearance, demo­cratic in manner, the Belgium king com­bines kindliness and benevolence with the dignity and reserve becoming to his rank. In personal appearance he is one of the most striking figures in Europe. More than six feet in height, his erect, almost military carriage and powerful shoulders belie his age of threescore and ten - for the 9th of April was the seventieth anniversary of his birth. A magnificent snow-white beard, as distinctive an ap­pendage as a peacock's tail, a pair of wonderfully penetrating eyes, an eagle nose, so long as to be all but inquisitive, a decided limp - such are the chief per­sonal characteristics of Leopold II. He has a strong dislike for display, seldom wears uniform, and, much to the distaste of his spectacle loving people, appears in state only on the rarest occa­sions. He cares little for society - at least, for such society as his capital af­fords - and still less for the opera, that favorite amusement of Brussels. He is said to have admitted that classical music bores him, and after having seen him sit, yawning, through a gala per­formance of "Faust" given in his honor, I have no reason to doubt the story. His tastes lie in the opposite direction. He is a thoroughly competent civil engi­neer, a skilled architect, a landscape gardener of no mean ability, a brilliant mathematician, an omnivorous reader, and a keen student of modern affairs: He is a hard worker, rising at five o'clock, even in winter, and being frequently the last of his household to re­tire. In the morning, when his routine session with the secretaries has been dis­posed of, he spends several hours in a perusal of the leading newspapers and reviews of Europe and America. During the day, he makes personal inspection of any building or other public work that may be going on in the neighborhood, usually on foot and unaccompanied. After dinner, he plunges into his favorite recreation of drawing up plans for fur­ther improvements in the cities of his kingdom, sometimes toiling with ruler and compass far into the night. The beautification of his capital has been King Leopold's special hobby. Not only did he suggest the series of fine boulevards and parks and plazas which make Brussels one of the most attractive of European cities, but he drew with his own hand the plans from which the en­gineers worked. "You will not see him. We do not see him. He is never here!" Only for a few weeks during the year does the tricolor float over the great white palace in Brussels, signifying that the sovereign is in residence. His sum­mers are spent in his seaside villa at Ostend, that wonderful city of pleasure of which he is the creator. Autumn finds him aboard his yacht, cruising among the Norwegian fiords. The winter months see him sojourning quietly at his beautiful palace of Laeken, or making flying trips to Paris, and to his villa at Beaulieu on the Riviera. He appears in military dress only on state occasions, when he wears the severe blue uniform of the commander-in-chief of the Belgian forces, his only decoration being the grand cross of the Order of Leopold. But should the visitor to Os­tend or Laeken see the sentries on duty suddenly bring their rifles to the "pre­sent" as they catch sight of a tall, white-bearded old gentleman in the gray tweeds and soft slouch hat of an ordi­nary tourist, he may be sure that he has been rubbing elbows with the king. Since the death of Queen Marie Hen­riette, the social functions of the Belgian court have been few and far between. Two state balls in February - which, by the way, are as brilliant as any in Europe - and two garden parties held in the palace grounds at Laeken, in May, make up the social calendar. These affairs provide opportunities for properly intro­duced foreigners to be presented to the king by their respective ministers. Al­though gentlemen are expected to appear at the balls in court dress - knee­ breeches, silk hose, and swords - and at the afternoon garden parties in evening dress, there is but little of that minute attention to detail which makes a pre­sentation at most foreign courts a labor rather than a pleasure. As at other capitals, the members of the American legation are easily distinguishable at court functions by being the only wear­ers of ordinary evening dress. A NOT TOO HAPPY ROYAL FAMILY. The royal household is presided over by the king's youngest and favorite daughter, the Princess Clementine, whose engagement to Prince Victor Napoleon has recently been announced. She inherits from her father her clear-cut, cameo-like profile and her unusual stature - for the princess is six feet in her stockings-and from her mother the intense love for horses that made the late queen one of the most accomplished horsewomen in Europe. Indeed, so pas­sionately is Clementine attached to her stable that more than once the king has found that the only effective means of disciplining her was to give orders that her favorite horse should be sold. It may be gathered from this, incidentally, that the princess inherits some of her father's positive characteristics as well as his features. The other two daughters of King Leo­pold, Stephanie, formerly wife of the Archduke Rudolph of Austria and now the Countess Lonyay, and Louise, wife of Prince Philip of Coburg, whose recent flight from her husband scandalized and yet won the sympathy of all Europe, are, as all the world knows, on very unpleas­ant terms with their father. As to the rest of the royal family, there is the Count of Flanders, the king's only brother, very deaf and very feeble; his son, Prince Albert, Leopold's nephew and heir apparent, known as le Mouton (the sheep) because of his timid manner and the faint, downy growth that adorns his chin; and last, though undoubtedly first in the affections of the people, Albert's wife, the beautiful Princess Elizabeth of Bavaria, who in the past three years has presented to her royal uncle two little grand-nephews, the Princes Leopold and Charles of Belgium. KING LEOPOLD AS A SPORTSMAN. The king is an ardent motorist and a keen yachtsman, though he takes only a mild interest in other forms of sport. He is frequently to be seen driving his car along the Belgian roads, and in traveling between Laeken and his town residence he uses a motor brougham almost exclu­sively. Some three years ago, while win­tering at Beaulieu, he was flying along the fine stretch of road that connects Nice with Monte Carlo. A chauffeur was driving, and the king was sitting be­side him on the front seat. As the big car swung around a curve at express speed, the motorists saw, close in front of them, in the middle of the road, a woman wheeling a baby-carriage and leading another child by the hand. The woman was too paralyzed with fear to move; there was no time to stop and no room to turn aside, for the narrow road was bordered by a ditch on either side. "Run into the ditch!" ordered the king sharply. The chauffeur obeyed, and the car, its speed diminished by the hasty applica­tion of the brake, shot into the ditch and turned almost a complete somersault, its occupants being hurled upon a grassy bank nearby. Fortunately, their injuries did not exceed a few bruises and a severe shaking-up; but it was a brave deed, nevertheless. While by no means a horseman, Leo­pold is moderately interested in racing, and Sunday afternoons during the sea­son generally find him in attendance at the Ostend race course, which was con­structed after his own suggestions, and almost under the windows of his summer palace. Perhaps his favorite recreation is pedestrianism. In the forest at Lae­ken, on the Promenade des Anglais at Nice, or on the Digue de Mer at Ostend, he may be seen in walking costume­s - slouch hat, thick-soled boots, trousers turned up - striding off, cane in hand. King Leopold is a millionaire many times over. In addition to his annual allowance of five million francs, he re­ceives a large income from his invest­ments in the Congo Free State and else­where. He is something more than a fluent public speaker; he comes very close to being an orator, and he speaks English, German, Spanish, and Italian quite as fluently as his native tongue. The Belgians have good cause to be grateful to King Leopold. He has done much for them. WHAT HE HAS DONE FOR BELGIUM. In no sense of the word a military man, he has applied business methods to the military affairs of his country, and from a disorganized jumble of gold braid, red tape, and incompetence, he has produced an army - small, it is true, but well offi­cered, well disciplined, and efficient. A dozen years ago Ostend was an al­most unknown fishing village on the bar­ren coast of Flanders. 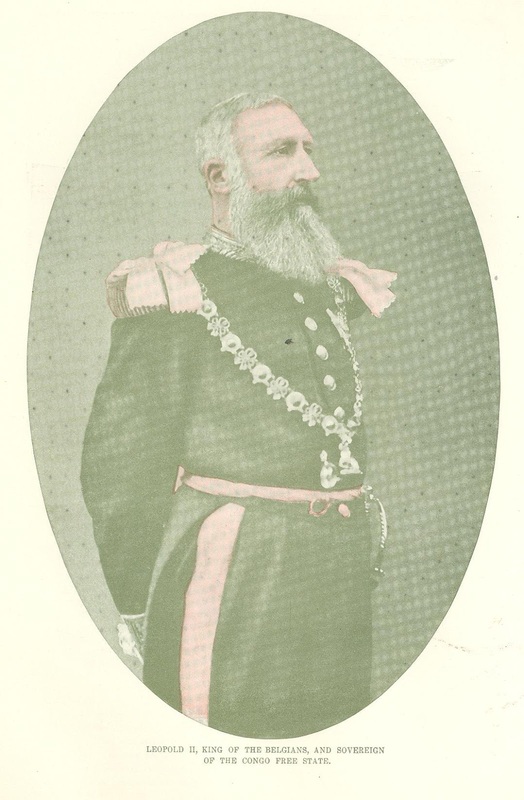 King Leopold saw no reason why Belgium should not have its share of the golden stream that flowed each year into Scheveningen on one side and Boulogne and Dieppe on the other. He waved his magician's wand, and there sprang from the earth the most beautiful city of pleasure in all Europe with its three miles of marble and stucco palaces, its magnificent beach, its race course and polo fields, and its gilt domed Kursaal. Golf became the rage, and the conti­nental pleasure resorts vied with one another in offering inducements to the golfer. There were no links worthy the name in Belgium, but King Leopold drew a hundred thousand francs from his private purse, and on the bleak sand­ dunes of Coq-sur-Mer there suddenly appeared the finest course in Europe. A museum was needed in which to show the progress and resources of the Congo State, and he gave to the nation his royal chateau at Tervuren, making a park of its beautiful grounds. King Leopold has helped to develop Belgian commerce at home and abroad. He has so carefully fostered all Belgian industries that his country is today, its size considered, the most active and successful manufacturing nation in Europe. He has settled ominous differences be­tween capital and labor. He has given to Belgium the cheapest and one of the best railway systems in the world. In his exploitation of the Congo Free State he has provided a most promising field for Belgian enterprise. THE DIFFICULTIES HE HAS OVERCOME. If ever a sovereign has had difficulties to contend with, it has been the king who has accomplished all these things. In spite of the strict impartiality of his atti­tude toward the various political parties of Belgium, the powerful influence of the clergy has persistently opposed his schemes, the aristocracy - the most con­servative in Europe - has held aloof from him, and the socialist element, which forms more than half the population of the country, has openly fought him. In addition, he has had his private differences with his daughters, who have brought suit against him in his own courts. Through it all he has held to his chosen way, thinking out his schemes and carrying them through to their conclu­sion with the indomitable self-confidence that has marked his every act since he ascended the throne nearly forty years ago. He is a strong man, is this King Leo­pold. He has enemies, but so have all strong men; and even his enemies admit and admire the power of his personality. It is said that he never forgets a kindness or forgives an injury, and it may be so. Certainly his hand is heavy on those that offend him, and he is one who knows how to punish. Originally published in Munsey's Magazine. June 1905.